Pesona Wisata Lembang - Dataran tinggi Lembang, Bandung, terkenal dengan hawanya yang sejuk dan panorama alamnya yang indah. Lembang memiliki beragam pilihan tempat wisata yang memikat sehingga sangat ideal menjadi pilihan masyarakat kota sebagai tempat melepaskan kejenuhan dari aktivitas sehari-hari. Selain menawarkan udara sejuk dan segar, area pegunungan juga menawarkan berbagai tempat dan kegiatan yang menarik untuk dikunjungi bersama keluarga. Tulisan Pesona Wisata Lembang ini dimuat sebanyak 6 halaman di Majalah Xpress Air edisi No. 13 bulan Maret 2017 rubrik Journey. Dalam artikel ini saya menulis tentang Gunung Tangkuban Perahu dan Floating Market Lembang. Pengalaman saya berwisata di dua tempat tersebut pernah saya tulis dalam blog ini pada postingan terdahulu. 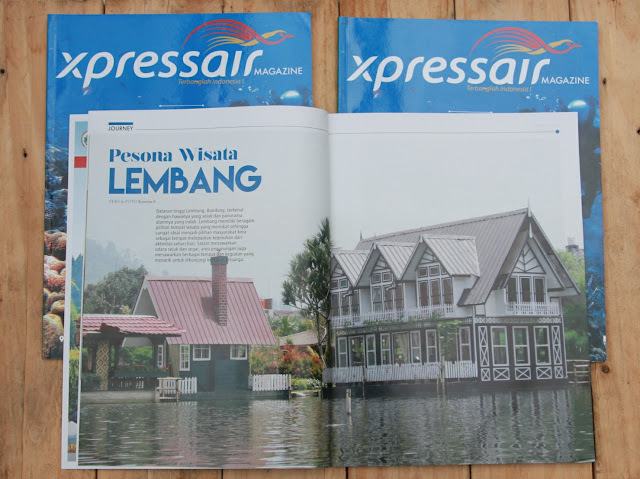 Jika tertarik untuk membaca ulang, saya posting lagi versi yang dimuat oleh Majalah Xpress Air, tapi dalam versi bahasa Inggris. According with its name, Floating Market Lembang (FML) is an integrated tourist attraction with the treats of floating market, lake, and various tourism objects which’s blended with the nature. Occupying an area covering 7.2 hectares, FML it’s such a traditional village which enable the visitors do lots of activities, such as culinary tour, play, shop, and even relax at the relaxation house. Floating market is located in the middle of a natural lake named Situ Umar. Dozens of snack boats lined up on the corridor sides. On top of the boats, various culinary are selling. Visitors just need to walk along the sides of the corridor, choose foods and beverages we want and eat there. It’s such a sensation eating food in the middle of a lake which surrounded by natural indulgent scenery. For the playground arena with families, FML provides a playground created with the aim to bring the children closer to the nature. There are water rides such as paddleboats, water bikes, canoes, and a water wagon. There is also a playground for ATV, a rabbit garden, a swan pond, a fish pond, a kora-kora, speed cars, trains and a carousel. In one corners of FML area, there is a farm village, named Kampung Leuit. In this village planted a variety of vegetables and fruits such as lemon, passion fruit, and strawberries that can be picked by own selves after paying in advance. Miniature of fields in Kampung Leuit make visitors feels as if in the real paddy fields. On the banks of the lake there is a row of gazebo with the interior having of nature that can be used as a place to sit and rest. 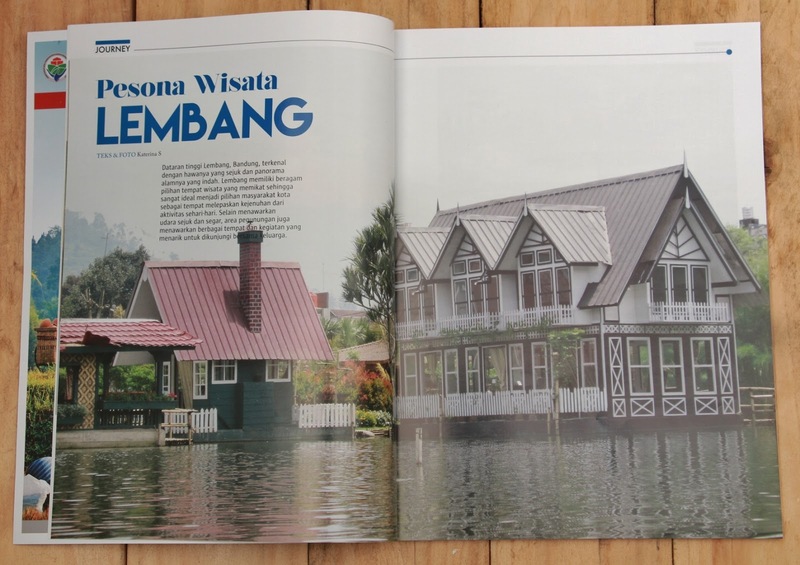 There are also original old and quaint houses imported directly from East Java, as well as relaxation floating houses with a unique architecture like Netherlands, Thailand, and Betawi Houses. Natural Park (NP) Mount Tangkuban Perahu is located approximately 20 km north of the city of Bandung. Though located in the north of Bandung, but it is still part of West Bandung. Though located in the north of Bandung, but it is still part of West Bandung. Mount Tangkuban Perahu itself is situated at an altitude of 2,048 meters above sea level, or about 6837 feet with an average daily temperature of 17 DC during the day and 2 DC at night. Tangkuban Perahu is an active volcano. Some active signs are in the presence of sulfur gas and hot springs that flow at the foot of the mountain like Ciater. The last eruption was recorded in 2013. However, the mountain is still relatively safe to visit. In NP Tangkuban Perahu there is a row of kawah (craters) that is Kawah Ratu, Kawah Upas, Kawah Baru, and Kawah Domas. Unlike other mountains, the mountain peak of Tangkuban Perahu has elongated shape and is similar to an upturned boat. This mountain has a central eruption that is always moving from the east to the west. Mount Tangkuban Perahu is a popular destination in Bandung because of the legend of Sangkuriang. This tourist attraction has a lot of enthusiasts, both locals and foreign tourists. Regional tourist area of Mount Tangkuban Perahu is managed by the Corporation of Forestry.